The Reading Recovery safety net is a partnership — a concentrated, continuous, united effort in which teachers, administrators, parents, and policymakers work together to change the status of low-achieving children in literacy. These Reading Recovery partners continuously evaluate the program by collecting data on every child served, analyzing strengths, and making recommendations for improvement. The effectiveness and efficiency of the teaching and training, provided through successful implementation, ensures that all schools can achieve Reading Recovery’s goal to dramatically reduce the number of learners who have extreme difficulty with literacy learning and the cost of these learners to educational systems. In the United States, innovation in education often fails — not because the approaches are not promising but because the necessary teacher education and systemic support are short-circuited. Dissemination of an innovation is dependent on effective implementation within each educational system, providing the necessary support for the innovation to succeed. 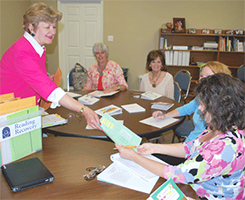 Educators make an investment in Reading Recovery knowing that they will get a high-quality program with ongoing support systems for effective implementation, as assured by the fact that it is a trademarked program. To ensure the integrity of implementation, as well as teaching and training, founder Dr. Marie M. Clay obtained a trademark for Reading Recovery. In the U.S., The Ohio State University grants the use of the Reading Recovery trademark to teacher training sites and university training centers annually on a royalty-free basis. The trademark ensures the quality of Reading Recovery, thus protecting the investment that schools, school districts, and states have made in the accelerated education of young, struggling readers. The Reading Recovery partnership operates on three levels. Specially trained teachers work with individual Grade 1 students for part of their teaching day. Teacher leaders provide yearlong training courses for teachers at Reading Recovery sites; they teach individual students, provide ongoing professional development for teachers, and monitor the implementation of Reading Recovery in their district(s) with the help of a site coordinator. University-based trainers prepare teacher leaders, engage in research, support program implementation at affiliated sites, and work with children. Reading Recovery can play a vital role in ensuring that students are able to meet the goals of the Common Core State Standards. Free resources include a 20-minute webcast, an article from The Journal of Reading Recovery, and a report from RRCNA.